AP Job Seekers, must involve in this APPSC Gazetted Officer Recruitment 2019 which is released on 22nd Feb 2019, But the AP Gazetted Officer Online Application link will commence on 26 March 2019 till on 16tj h April 2019 date the Applicants may complete the AP Gazetted Officer Application form submission Process. The Written exam will be tentatively planned on 02 weeks of June 2019. So, the Aspirants may need to fill up the 31 AP Gazetted Officer vacancy which is going to recruit in the Posts likely be Assistant B.C. Welfare Officer, Civil Assistant Surgeon, Zilla Sainik Welfare Officers, & Technical Assistant, Assistant Director, Assistant Chemist, Town Planning Assistant & other Posts. So, once you clear the Given AP Gazetted Officer Notification details then only apply for this recruitment. Andhra Pradesh Public Service Commission has released the APPSC Gazetted Officer Notification for the Seekers who are living in Andhra Pradesh State. So, the Applicants who are ready to place in the PAPC organisation they shall be made out clearly the given Andhra Pradesh Gazetted Officer Recruitment 2019 once you check out the Notification there is almost cover all the Details which are useful for the Seekers to register the APPSC Gazetted Officer Online Application Registration process. In the actual way of process, there is the Need of known the APPSC Gazetted Officer Vacancy likely Assistant BC Welfare Officier, Civil Assistant Surgeons, Zilla Sainik Welfare Officers, & Technical Assistant And other Posts. So, as a matter fact, the APPSC Released 31 Gazetted Officer Jobs in AP of the Aspirants who have the interest in Attempting the Recruitment they just find out the Education Qualification if they are eligible or not. based on the Skills only the APPSC will Select the people to promote the Further Selection Rounds which are such as written examination, Interview. So, based on the APPSC Gazetted Officer Application form Given Details the Officials will scrutinise Details of this APPSC Civil Assistant Surgeon Notification if the given particulars are matched with the Academical Certificates as they are finally able to participate to the hiring rounds. So, the officials are making a plan to recruit the Candidates who are showing interest on theses Andhra Pradesh Gazetted Officer vacancy. Must Possess a M.B.B.S. Degree or an equivalent qualification as entered in the schedule to the Indian Medical Council Act, 1956 as subsequently amended. Must be a permanent Registered Medical Practitioner within the meaning of the Law for the time being existing in the State. Shall be exclusively filled by ExServicemen from the Army, Navy and Air Force. No Ex- Servicemen who retired below the rank of Captain or equivalent Rank in the Army, Navy or Air Force shall be eligible. Application payment is the kind of process for APPSC Gazetted Officer Recruitment Notification. On this page, we are taking the responsibility to give all the Specifications that need to verify & commit to participating in this APPSC Gazetted Officer recruitment 2019. So, based on the given details all the Contenders make sure and without getting any doubts can able to submit the AP Gazetted Officer Online form. based on the Instructions all the Aspirants may get register to this AP Gazetted Officer Recruitment If any of the Aspirtanst have doubts in Applying this AP Civil Assistant Surgeon Vacancy they shall be applied before 26 April 2019. The Process will be commenced on 26 March 2019. So, in this Process of complete APPSC Assistant B.C. Welfare Officer Recruitment maximum number of people are showing interest in checking off the details in order to start the AP Gazetted Officer vacancy 2019 which is available from 26 March 2019. In fact., the Applicants may get the official Notification which is available on from 22nd Feb 2019. So, before the Link activation, the Applicants may start the 26 March 2019. So, the Aspirants may start the Examination preparation session with the help of the Syllabus PDF. Once, You know the Exam Paper you can start over the to refer the Question Paper which is important for the sake of Applied one. So, use them and feel comfortable while applying this APPSC Gazetted Officer recruitment. 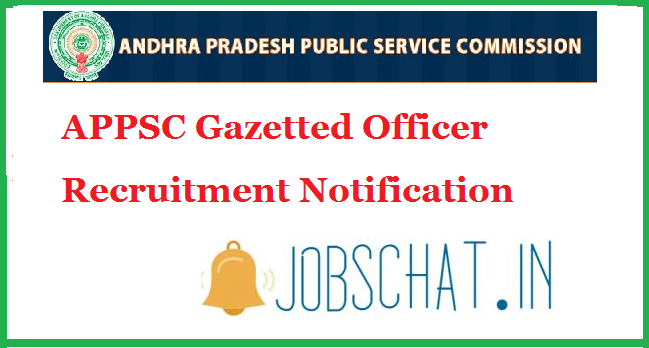 The post APPSC Gazetted Officer Recruitment 2019 | Apply Online for 31 Andhra Pradesh Gazetted Vacancy appeared first on JobsChat.in.